(Updated 21/9/09): The latest of the quarterly title Egmont Classic Comics featuring IPC's girls comic Misty is now available. As with the previous two titles, Roy Of The Rovers and Battle Picture Weekly, the issue is available exclusively on the high street from WH Smith at a cover price of £3.99. WH Smith's placement of these titles on their shelves can make them problematical to find - Roy Of The Rovers was racked with the football magazines (which seems a logical choice) while Battle Picture Weekly was racked in the Military History section (go figure). Misty on the other hand has been racked in the Hobbies - Sci-Fi section which may seem a little strange but it does at least mean that the supernatural girls title, in some WH Smith stores at least, can be found sitting beside the current issue of 2000AD, much as it would have done thirty years ago when it was first published. 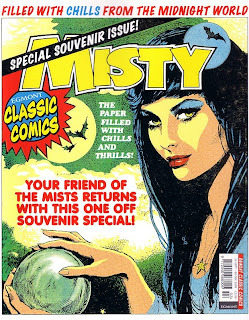 For anyone who cannot get to a WH Smith or cannot find it in their local one, Egmont have advertised back issues of Egmont Classic Comics in the Misty title. Anyone who wishes to get copies of the Roy or Battle, the price including P&P is £5.50. At this point, Egmont can only send out Misty when it comes off sale (9th December) and Buster when it comes off sale, as Smiths have an exclusive slot until then. For further information e-mail comicarchive@egmont.co.uk for more details. The next issue of Egmont Classic Comics will feature Buster and be available on 9 December 2009.